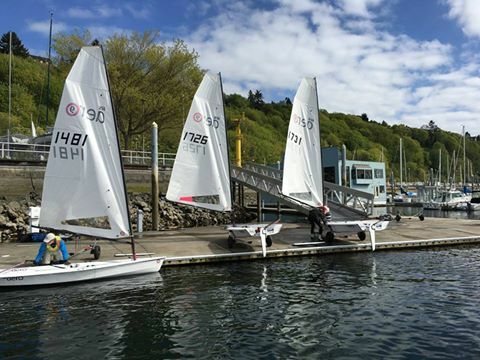 Now with 20 boats in Seattle and growing they had a great season opener at Corinthian Yacht Club's Puget Sound Spring Regatta on April 9/10th. Many thanks to Scott for the report and to event winner, Michael O'Brien, for sharing his Top Tips. 'We had a nice week-end for PSSR small boat, with 10 Aeros registered and 9 on the water. Heavy fog burned off midday on Saturday and the RC got off two sunny races with the shifty southerly and beginning of a huge flood shaking up the traditional head for the breakwater strategy. Dan was dominant with a 1,2 for the day. Sunday was cooler with a puffy southerly keeping it interesting for four races mixing hard hiking and going lighter into the afternoon. Congrats to Todd, Mr. Consistency, nothing lower to throw out than a third place and wrapping up second overall. Dan had a race where he apparently prioritized saving his sunglasses over keeping the boat right side up, but still spent most of the weekend in the top three spots and was a very close third. Eric posted rock steady 3's 4's and 5's in heavy air and light, well ahead of the next boat. 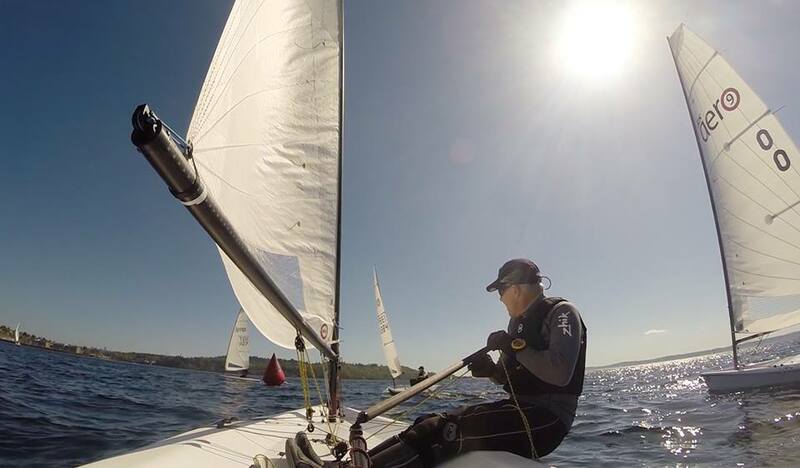 BTW, who is that masked man with the pink sail and why is he so fast upwind? Welcome to Kerry who raced the loaner boat and looked way too comfortable in it not to own one. 'I was really impressed by how close we all were at many windward marks. Jacques, Eric and Dan H. showed some impressive improvement and were first or right at the front at the top mark in several races. I’m sure Paul would have been there too if he had 2 sqm more sail area. 1. A few had their vang too loose downwind. You need some vang (except when drifting) to stop getting too much twist. You need much more than in a laser. If your boat is tippy, then you probably don’t have enough vang on. Too much twist is slow. Too little is slow. You want a little bit of spring at the 2nd top batten. It should be springing back and forward a bit with each gust, but not opening up the entire leach. 2. A tippy boat is a is slow boat downwind. Steady is fast. That does not mean you do not work the waves, but your boat should not be unstable. Again, the vang is your friend. If you have your mainsheet too far out, the boat will want to death roll. 3. Crossing dead down wind is slow when sub-planing. As the wind was a bit from the east on both days, it was faster to do a deep broad reach, then gybe and come back. Every time I crossed DDW and went by the lee, I lost about 1-2 boat lengths. However, if I tried to soak low and then pick a good wave to do an up-turn to a reach, I kept my average speed up. 4. You should be trimming the main directly from the boom in < 8 knots. I take the aft two lines and thus get a 1-1 to the boom. You should feel a wave surge behind you, lean in a little to get the boat to heel to leeward and then flatten and trim in to surf a bit on the wave. As the wave passes, you gently heel to windward by easing the main and drive a bit to the mark. This will bleed off your speed and then you repeat on the next wave. The key is smoothness. It is really easy to lose flow on the sails or foils. Note: Dan is exceptional in achieving and sustaining a more aggressive style. This too can work, but it takes a LOT of practice to perfect the timing with the waves. Done right, his technique may be faster. Done wrong, it can be a lot slower.